Jessica Andrade might represent the most realistic challenge to Joanna Jedrzejczyk's title since the straw-weight queen took the throne back in March of 2015. The Brazilian challenger has gone from strength to strength since moving down to the UFC's 115lbs class in June last year. In retrospect the move seems obvious—Andrade was a short, stocky bantamweight who was often dwarfed by her opponents but who fought at a furious pace and had great physical strength and hitting power. At straw-weight Andrade is still loses the 'tale of the tape' against most of her opponents, but fighting women who are around twenty pounds lighter than she is used to seems to have done nothing but help Andrade. Andrade was always in the business of overwhelming her opponents with pace and power, but her straw-weight bouts have been punctuated by moments in which she simply ragdolls her opponents. One nice example of Andrade's strength in action was the casual way in which she dealt with Joanne Calderwood's closed guard. Wanting to push Calderwood into the fence, Andrade opted not to scooch towards the fence and instead simply hoisted Calderwood off the mat and slam her down against the cage. Andrade was a pretty primitive fighter when she came to the UFC. She was another Brazilian striker looking to follow in the footsteps of Wanderlei Silva. The fans love aggression and fighters hate having to deal with non-stop, windmilling advances once they run out of space—even if it makes a fighter more vulnerable to counter strikes those are compelling arguments. But we are not about to pretend that isn't still a large part of her game. The story of Andrade's most recent streak of convincing victories has been overwhelming her opponents and pounding on them as they cover up along the fence. Yet there are a couple of things that Andrade has adapted to make this style work much, much better for her. The first is the addition of body shots. Windmilling to the opponent's head is all well and good, but even if the opponent stays static and simply holds their forearms up, the swinging fighter is going to miss a lot of shots. Wanderlei Silva's career was built around swinging wild but he very rarely knocked opponents out with his hands alone. More often Silva would swing on his opponent until they covered up and then grab a hold of a double collar tie, often around their forearms, and begin trying to knee them in the head and midsection. The same was true of much of Mauricio 'Shogun' Rua's PRIDE FC run. Jessica Andrade does not use the double collar tie all that much and in many ways she would be making her life harder if she tried, being so much shorter than most of her opponents. But in recent fights Jessica Andrade's use of body shots has been spectacular to watch. Knockout power is less common in the women's weight classes but even if Andrade hits harder than most, she is better off pounding the body with volume than simply aiming for the head and hoping for a knockout. The great thing about bodywork, of course, is that a fighter can catch his opponent breathing in and get that one shot crumple, or the fighter can keep digging to the body and readily see the change in his opponent as the minutes tick on. Angela Hill fought a wonderful, mobile fight against Jessica Andrade but the frequent body shots soon began to creep up on her and slow her legs. The other noticeable change in Andrade is her awareness of her opponent's movement and her doubling and tripling up on the same hand as a result. That might seem simple on paper but if you have watched a couple of dozen fights you will be all too familiar with the fighter swinging alternate bombs against an opponent on the fence and the opponent escaping by circling away. Breaking the left-right-left pattern is a hard thing to do because if anything it seems unscientific. What is more primitive than simply swinging in the same hand over and over? But if the opponent is circling to a fighter's right, a double or triple right hand travels the shorter path, intercepts their motion, and is far more useful than long left hooks which are going to connect flaccidly at best as the opponent moves away from them. Against both Angela Hill and Jessica Penne, Andrade's doubling and tripling up on right hands and left hooks allowed her to dig hard, repeated blows in to the body and head alternately. As a grappler, Andrade came up on the losing end a few times at bantamweight but has looked powerful and competent at straw-weight. Able to get the takedowns seemingly when she wants to, Andrade's work against Joanne Calderwood on the mat was top notch as she dropped heavy blows from half guard before snatching up a fight finishing guillotine (turned DDT) as Calderwood came up to attempt a sweep. 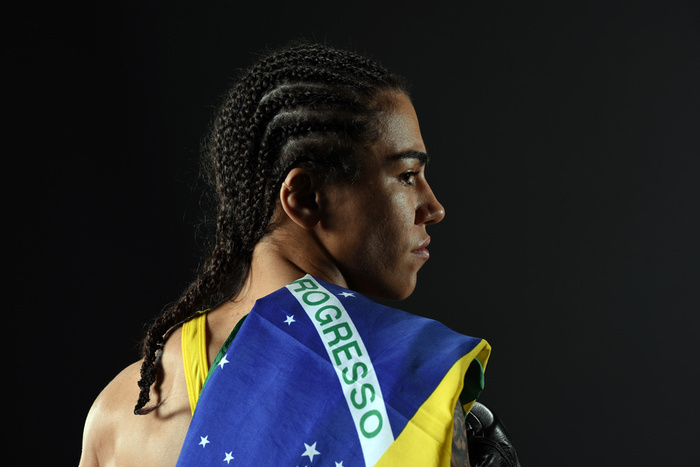 As a challenge to Joanna Jedrzejczyk's throne, Andrade brings interesting elements that have been absent in previous challengers. Firstly, she recognizes the value of the fence and does her best striking along it. Jedrzejczyk uses the fence extensively to fight up from the mat and to defend takedowns, and was put there often by Claudia Gadelha, yet Gadelha is largely a non-threat as a combination striker or an infighter and instead insisted on holding on to a grapevine and wasting all her energy on arm punches which did little to damage the champion and only served to gas Gadelha by the second round. Furthermore, Andrade is not a fighter who wants to hold opponents on the fence. Gadelha attempted to do that and Jedrzejczyk's ability to fight for grips and angle out was just too much, especially as she was not eating anything meaningful in the striking department while she did so. Andrade instead opens up with strikes along the fence and only falls into clinches occasionally. Jessica Andrade is great to watch and matches up interestingly with some of Joanna Jedrzejczyk's significant habits, but Andrade herself carries a few key openings which could be exploited by a striker as adept as Joanna Jedrzejczyk. “You Can't Stop the Bum Rush” might have been the third studio album by Len (which contained such memorable tracks as “Steal My Sunshine” and “Steal My Sunshine”), but it is not a good mantra to build a fighting style around. Jessica Andrade's means of closing the distance are few and exploitable. Most of the time she will hold her palm out, attempting to parry jabs, and then leap in afterwards with her left hook. This in itself makes her very susceptible to the jab-left hook double attack, or Peter Aerts' favourite jab to lead leg high kick. Andrade also sits on the end of her opponent's reach, waiting to rush in, and will often lean back away from her opponent's strikes. Getting caught in a lean can be disastrous which is why pulling straight back from punches is rarely advocated as a default defence by most coaches. A fighter as experienced as Joanna Jedrzejczyk is likely to pick up on this and feint or fake Andrade into the lean simply to score a good straight right on a helpless target. There is not a lot of science to an Andrade advance, it is simply a rush forward. This means that Andrade is especially susceptible to getting intercepted with a counter. This needn't be a punch, often the best method to deal with an overaggressive rusher is to project a large shard of bone into their path. This could be an elbow, a knee, or even the head. Joanne Calderwood's lead leg heavy style of kicking meant that Andrade's first rush was actually halted by Calderwood's raised knee. Angela Hill also used intercepting knees beautifully throughout her fight with Andrade. And Joanne Calderwood's single attempted elbow as Andrade rushed forward was enough to cut the Brazilian wide open. If Andrade could benefit from anything it would being adding a jab to her game. The jab-and-duck is one of the most valuable distance closers for a shorter fighter and was used time and time again by Roberto Duran. The purpose of the jab being simply to goad a counter punch out of the opponent, which flies over the attacking fighter's shoulder as they close the distance to hit the body or head. Similarly Mike Tyson made extensive use of a deep, dipping jab to the chest to work his way to the inside. For more on those strategies read The Elements of Style: The Jab. Andrade also seems mostly reluctant to use low kicks even though these serve wonderfully to break the opponent's stance and stand them still long enough for Andrade to get to the inside. And really this is the largest problem that Andrade is going to face in her title shot: she can be kept on the outside too long. Angela Hill showed that with a good jab and low kicks she could keep Andrade off her quite readily. It was when Hill committed to right hands and techniques which brought her closer to Andrade's own hitting range that Andrade was able to follow her out with the left hook. A final interesting area where the fight may take its dynamic is in the double collar tie. Each of Andrade's straw-weight opponents has realized the value of it. It has allowed them to threaten knee strikes and to control her posture and shoulder rotation. Angela Hill used it to escape the fence numerous times. But equally the double collar tie is a position in which the taller fighter's midriff is open to body shots. The play off between effective double collar tie use and effective two-handed digs to the body has consistently been an important point in Andrade's recent bouts. Jessica Andrade challenges straw-weight champion, Joanna Jedrzejczyk at UFC 211 on May 13th.